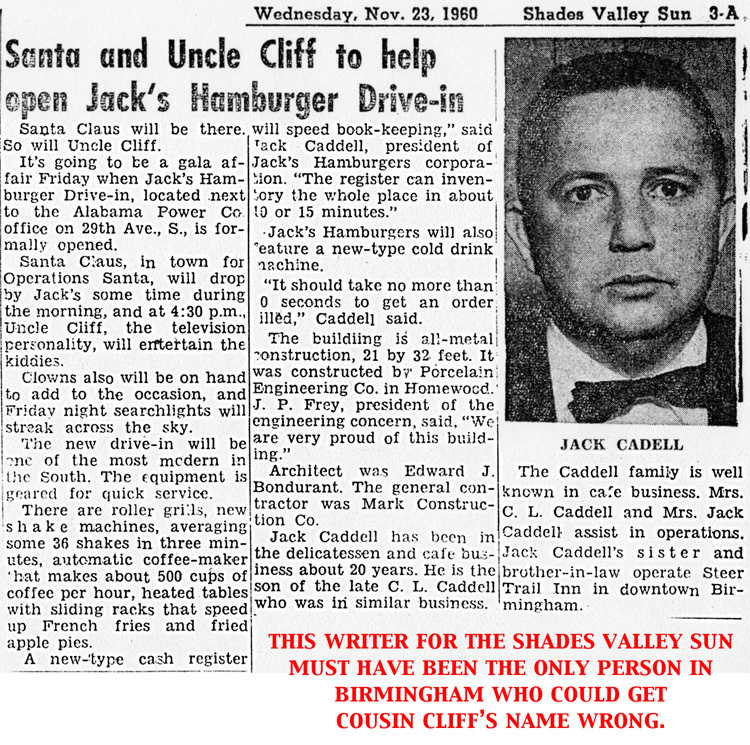 Jack Caddell (born c. 1927 in Birmingham; died March 1991) was the founder of Jack's Hamburgers and Hamburger Heaven. Caddell, the son of Carl and Clella Caddell, was born into a family of restaurateurs, owners of Caddell's Highland Plaza Restaurant, the Caddell Delicatessen, and the Steer Trail Inn. Caddell served in World War II. In 1947, while working at the delicatessen, he spotted Catherine Williams from the window. He tracked her down later and began a courtship that ended with a June 1948 wedding. She immediately joined in with the family businesses, running the Homewood Car Wash with her husband. He purchased Homewood's Little Southerner supper club and renamed it Jack Caddell's. Later he opened the Pig Trail Inn barbecue restaurant, a teen hangout in Homewood. In 1960 Caddell researched the operations of the newly-franchised McDonald's restaurant chain. He created Jack's Hamburgers based on that model, with the first drive-in location opening in downtown Homewood on November 21 of that year. The chain grew to 17 locations before he sold it in 1969 to Florida Capital. Caddell's next venture was a Jacque's restaurant and lounge, a short-lived upscale concept. In 1982 he founded Hamburger Heaven on Crestwood Boulevard. Caddell suffered from heart problems in 1990, and died the following March following a heart attack. He was survived by his wife and two children, Jack Jr and Elizabeth. Catherine sold the successful restaurant to Eli Stevens in 1992. This page was last modified on 7 March 2015, at 18:21.